This neat little gauge helps control your fuel mileage. By installing the Ecometer, it helps the driver to pay more attention to bad driving habits that cause poor fuel economy. The Ecometer is designed for someone who commutes regularly for work, and would like to make fewer fuel stops each year. It won’t change the amount you pay per gallon, but it just might make you aware of how you’re driving, and give you some incentive to drive more economically. 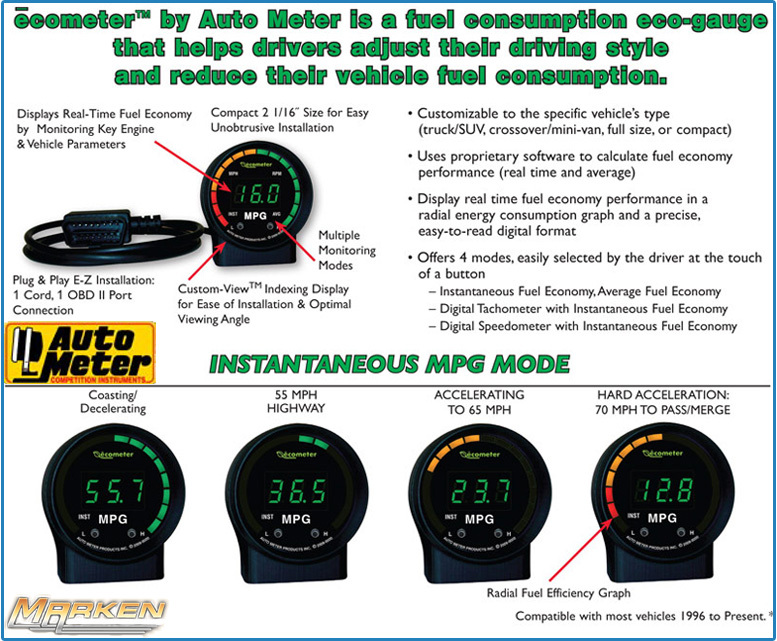 The 2 1/16” gauge simply plugs into the OBD port on most OBD II compliant vehicles, and accesses the information from the factory computer. It can read your fuel consumption and report back real-time miles per gallon figures, as well as your overall fuel consumption and average fuel economy. It also has the ability to display other functions from your car’s computer, such as the tachometer or speedometer, but the main focus is on driving economically. The Ecometer includes a hook-and-loop Velcro pad for mounting it to any flat surface, and includes a rubber ring to protect the surface. You can actually see when the meter is on green, or red. There are 2 versions depending on the year of your vehicle. Part # 9100 is compatible with most gasoline OBDII equipped vehicles from 2008 to present. Part # 9105 is compatible with most gasoline OBDII equipped vehicles from 1996 to present. To purchase, click on part number above or call 1-888-401-1362. This is my 154th thread started! AS easy as 1-2-3. unlock your mileage meter if you don't currently have one!!! V6 Auto 2WD Fuel Economy?